In the early 1960s, a group called The Pendletones adopted their name in honor of the surf uniform of the day: Pendleton shirts worn over tee shirts with khakis. 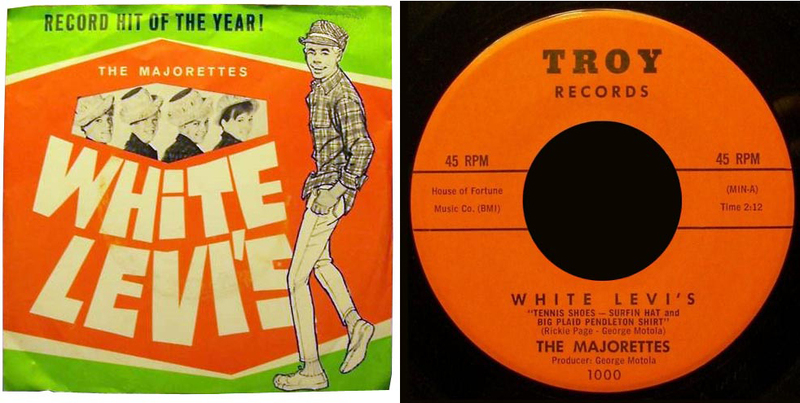 The original lineup included brothers Brian, Dennis and Carl Wilson, their cousin Mike Love, and friend Al Jardine. The Pendletones soon changed their name to the Beach Boys . 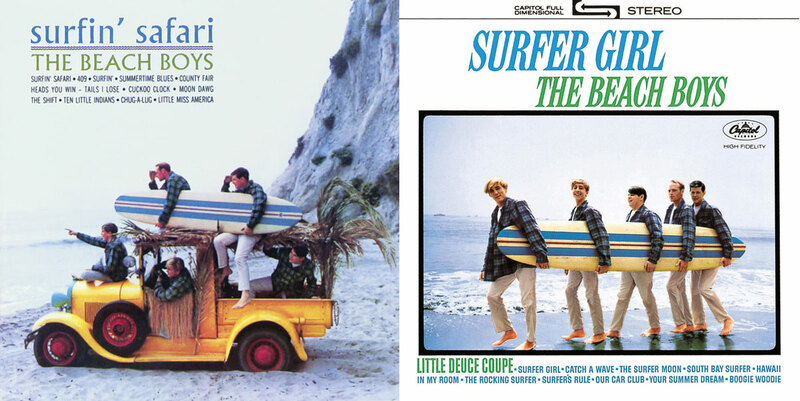 Even though only one member of the group had ever been on a surfboard, they sang about the California surfing scene; waves, sunshine, cars and girls. This might have been simple subject matter, but layered instrumentation and soaring harmonies made these songs anything but simple. Under the unique artistic leadership of Brian Wilson, the Beach Boys defined surf music. And though their name changed, their uniform didn’t. The band wore this blue and charcoal plaid shirt on the covers of 45s and LPs throughout the early 1960s. The Beach Boys’ Pendleton shirts were part an existing trend. When surfing came to California in the late 1950s, surfers devised performance wear: swim trunks and plaid Pendleton shirts over a layer of Vaseline. Surfers wore the same shirts over light pants on the shore, and a fashion trend was born. That’s a Pendleton shirt cover of that 45, even though they named the song after the pants. You can give it a listen here, and don’t be surprised if you start singing along. But let’s get back to the shirt made so popular by the Beach Boys. In 2002, Pendleton celebrated eight decades of Pendleton shirts by bringing back iconic shirts from each decade. To celebrate the 1960s, we brought back the Board Shirt in the same plaid seen on all those record covers. We call it the Original Surf Plaid. The shirt has stayed in the line ever since. We’ve used it in caps, hats, bags and jackets. It’s still made in the original 100% virgin Umatilla wool as it was back then. Others claim the honor for the Board Shirt. We’ll let you decide. No matter where you are, or what’s the weather, this piece of the sunny California surf scene will take you to the waves. Surf Pendleton is a growing part of Pendleton’s spring offering, with looks for men and women that feature natural and technical fibers, sun-bleached colors, and relaxed SoCal style. The collection builds on a connection between Pendleton and surfing that goes way back—waaaay back to the birth of the American surf scene in the early 1960s. For generations, a Pendleton wool shirt has been a gift of gratitude for dads young and old, near and far. When Dad opens a package and finds a Pendleton, he knows you’re paying attention to what he wants. He’s always had your back. Maybe that’s why you want a Pendleton shirt for his. What’s your father’s favorite style? It might be The Original Board Shirt™, the original surf shirt since the early 1960s. The loop square collar and square hem make it suitable as a lightweight jacket, and the flaps on those bias-cut patch pockets are recognizable a mile away. Or maybe your father is a Sir Pendleton™ man. This lightweight worsted wool shirt has been around for over fifty years without gaining an ounce. We have a Black Watch tartan version right now—a traditional pattern for a traditional dad. He’s your true love, your best friend and your partner in parenting. Celebrate your shared path with with the Trail Shirt, recognized by its soft sueded elbow patches. It also has a pencil slot on its chest pocket, since Dad is so often the official pen-carrier in the family. Our most traditional shirt (according to our customers) is our Fireside Shirt. This is trad all the way, with one matched-pattern chest pocket and a button-down collar. The Lodge Shirt is cut just like the Fireside, but with a spread collar. Both are available in Black Watch—or as we like to call it, the stealth tartan. It’s beautiful and touching to watch young dads navigate the new role of father. You’ll be there for him as he takes on this new role. Mark this rite of passage with a Pendleton shirt. You can’t go wrong with the Original Board Shirt™, of course, maybe in one of our Surf Pendleton plaids or stripes. But for the younger man, that Western fit is a hit, so also consider the Canyon Shirt. This is a snap-front and cuff model with peaked snap flaps on its two bias-cut chest pockets. The front and back yokes are on the bias, as well. We have fitted versions of many of our shirts, cut closer to the body and a little higher in the armholes for a contemporary look. We also have a range of new shirt models like the Buckley, the Boro and the Maverick that you should check out. With Pendleton wool shirts, Father’s Day is better than ever. Click on the model below to see the details of your favorite style. Breathtaking productions rich in imagery, athleticism and humor: Led by Emmy Award-winning choreographers Jamey Hampton and Ashley Roland, BodyVox is known for its visual virtuosity, distinctive wit and unique ability to combine dance, theater and film into breathtaking productions rich in imagery, athleticism and humor. Since its founding in 1997, BodyVox has toured to critical acclaim on stages around the world, developed 9 award winning films, 30 original shows and 3 operas, featuring more than 200 original dances. We were delighted to open our BodyVox 2017 calendar and find some beautiful shots featuring Pendleton. March takes flight with this image. Of course, you all recognize the Original Board Shirt made famous by the Beach Boys. The blanket is the Water Blanket from our series that benefits the American Indian College Fund. Inspired by a blanket in an early 20th-century photograph by Edward S. Curtis, this blanket is inspired by the peerless weaving of the American Southwest. It incorporates classic Navajo elements in an eye-dazzling pattern. The central dragonfly, an emblem of water, symbolizes life. Later in the calendar, we found this gravity-defying hackysack game.